Have you ever seen a judge, the supreme presiding officer of a court, also donning the mantle of a peon calling out the names of plaintiffs and respondents? If you run into one, you sure would chortle. Have you ever come across a celebrated author confusing real life characters with the protagonist and his wife of his own work? If you stumble upon one, you sure would be bewildered. Simla Coffee House, a powerful satirical drama on human angularities that opened to a packed audience, despite heavy downpour in the City of Hyderabad and traffic going out of gear, on a working day evening, at Ravindra Bharathi, just reinforced the confidence of theatre connoisseurs in the art form growing from strength to strength . Veteran theatre personality and commentator Vijay Marur, who has been compering the Qadir Ali Baig Theatre Festival 2014, told MeraEvents that he was delighted to find a different crowd for different shows. A renowned stage artiste that he is, Marur was specially happy for the diversity in the patrons — audience patronising the dramas of different themes come from diverse social genres. For Sundari Sundarudu, a Telugu play, the crowd was very native. Dance aficionados thronged Vani Ganapathi’s ‘Dwaaram’. The Hyderabadi love story, Savaan-e-Hayat, the home production of Qadir Ali Baig Theatre Foundation, had true blue Hyderabadis congregating. Simla Coffee House, as it was described in the preview, is a nested story or a Frame Narrative. Actor S M Zaheer, sitting at a coffee table and working on his lappy, excelled in his role as Anup Chander, a celebrated writer (a fictitious character). As a fanatic reader of Anup Chander‘s works, actor Asif Sheik, gave an impression to the audience that he (his character name was Rahul Verma) was actually engrossed in the role of the protagonist Tarun Mathur of Tere Chhall, the ‘blockbuster work’ of Anup Chander, so much that he actually finds that he was exactly living the life of Tarun Mathur, only when he realises his own marriage was on the rocks. 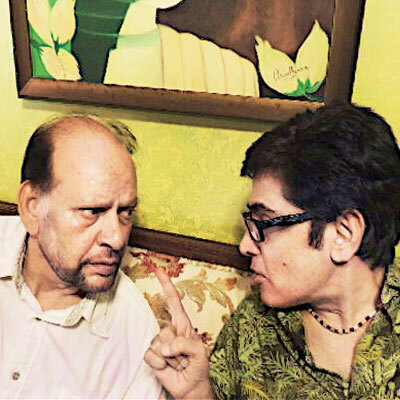 The frustrated Rahul Verma, on a couple of occasions, throttles and attacks Satish Kashyap, the otherwise overactive waiter at the restaurant, Simla Coffee House, donned by playwright and actor Rakesh Bedi. Rahul Verma‘s wife applies for a divorce and engages a lawyer. All of them (characters) meet at Simla Coffee House and Anup Chander proposes that mock proceedings of the court be enacted there itself to resolve the discord out of court. The lawyer too concedes the idea.When Anup Chander volunteers to argue the case on behalf of his fan, the lawyer derides him, bragging about his own knowledge of law and capabilities and that he secured 64 per cent in his law exam. As the conversation moves on, Anup Chander reveals that he secured 93.4 per cent and held a record for 30 years which was broken only recently and that he graduated from Pune Law College in 1975. Explaining about his choice of not donning the black robes either in the bar or on the bench, he takes potshots at the legal profession quipping that the biggest liar wins and the arguments are built on blatant lies. As the lawyer understands who Anup Chander is, he instantly develops a kind of adoration and hero worship for the lawyer-turned-writer. Before ‘winning over’ the lawyer, Anup Chander flaunts his knowledge of how the lawyer’s father had manipulated the facts in a case several years ago and won it on behalf of the accused, while the whole society understood the reality, which was otherwise, in its true spirit. With the consent of all, Satish Kashyap is hired to don the judge, thanks to his knowledge of social fabric and experience in life, as the matter pertains to familial discord. Of course, Rahul Verma initially raises objection scoffing off Satish Kashyap’s competency, but falls in line after Anup Chander’s advise. Holding the audience in raptures, Satish Kashyap demands that he be addressed as “Me Lord” and to let him celebrate his moment of glory, as he is a tormented husband at home himself. While adorning the chair of presiding officer, he also calls out the names … Rahul Verma haajir ho…sending the audience into peals of laughter. The ensuing arguments, the conclusion , the unwavering and unstinted love and concern for Rahul Verma by his wife and how Anup Chander is left high and dry when he confuses the real life characters of Rahul Verma and his better half with Tarun Mathur, the protagonist of his Tere Chhall, and his wife form part of the drama. The judge directs the author to change the story line, as Rahul Verma and his wife agreed to live together in their marital bliss. The jibes taken by the artistes at societal aberrations were subtle and sensitive, yet straight and pointed.All actors excelled in their respective characters and it was a 90-minute visual treat for the people of Hyderabad. In case, you missed being part of this play and wish to know more about when and where it took place, please read through the preview of the play that was posted earlier.